Oh dear, not a handsome Stanley….! Richard III, the Merovingians, Rothley, the Templars and The De Castro Code….! The painted tapestry below is from Rothley Chapel in Leicestershire. 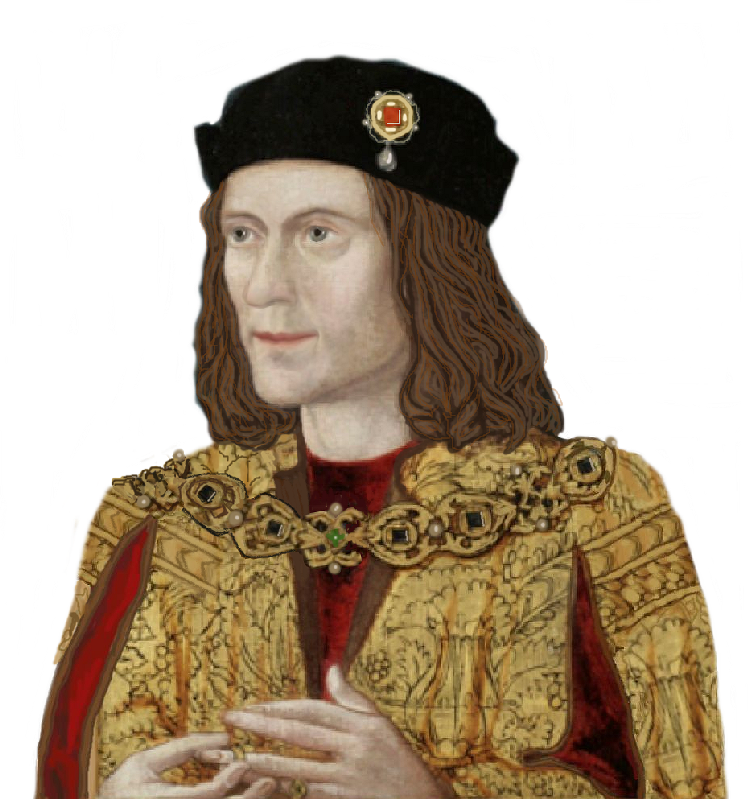 Strangely, since the article that prompts me now (see link below) was written in 2012, no one appears to have noticed the great likeness of the depicted English king to Richard III. At least, if they have, I don’t know of it. It’s Richard, even to his clothes. Clearly, he has been based on the famous portrait in the National Portrait Gallery. So let’s consider the De Castro Code article for a moment. It’s a very interesting and clever allusion to Dan Brown’s The Da Vinci Code, and to conspiracy theories in general. I love a good conspiracy theory, from the so-called fraud of the moon landings to whether Hitler lived on in South America after World War II. I’m not saying I believe them, just that they fascinate me. So do not even mention Rennes le Château or pirates’ buried treasure at Oak Island. Or Atlantis being in Antarctica or a real flying saucer being captured at Roswell and kept at Area 51. All juicy stuff, and eminently readable. 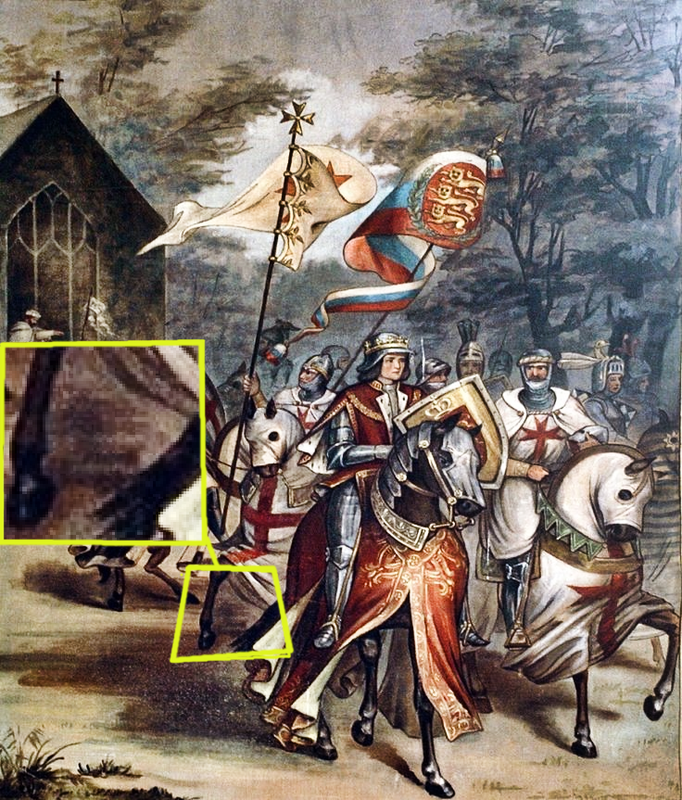 In the case of the illustration at the beginning of what I now write, it appears to depict Richard III with Templar knights, the conspiracy is referred at (very neatly and appropriately) as The De Castro Code. (St Mary de Castro is a church in Leicester) Dan Brown’s world-selling novel concerned a theory that Jesus married Mary Magdalene, and founded the Merovingian dynasty of French kings. With the Norman Conquest of 1066, families with Merovingian blood came over to England. They were the de Beaumonts and the de Montforts. Leicester first Norman earl, Robert de Beaumont, married a lady of undoubted Merovingin descent, so that their son, Robert le Bossu (who built Leicester Abbey), became the first truly Merovingian earl. This Merovingian line only died out when Simon de Montfort was killed in 1265. 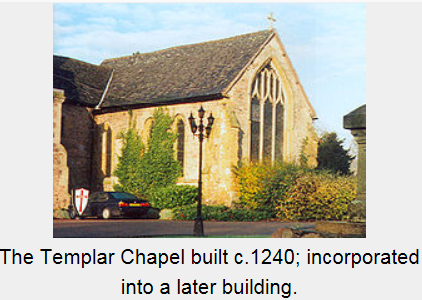 So for 200 years, Leicester was a Merovingian stronghold in England, with rulers who claimed divine descent. Well, I doubt they promoted such a claim at the time, for it would have brought the wrath of Holy Church down upon them, and the awful fate that would entail. An English king was hardly likely to defend nobles who boasted such a claim. Anyway, the upshot of all this is that the Merovingians were also in England. Specifically Leicester. What might this imply – if they were indeed of divine descent? So, what is the artist saying? Was he an early Ricardian, pointing out on the q.t. that Richard was as betrayed and defamed as the Templars had been? After all, the Stanleys betrayed him on the battlefield, and the Tudors defamed him at every whipstitch. Or… Might there be a hint that Richard had Merovingian blood in his veins? That would mean Edward IV and George of Clarence had as well, of course, but the artist seems concerned only with Richard. Ladies and gentlemen, I have not covered everything from the article, such as all the other similarities with The Da Vinci Code’s conclusions (St Mary de Castro even has a window depicting the Last Supper, and a possible Mary Magdalene), nor have I wondered about the Templar connection with the similarly named Rosslyn Chapel in Scotland, but I leave you to cogitate this most puzzling of new Ricardian mysteries…. Postscript: I have been reminded (by Christine Smart – thank you, Christine!) that in the spring of 1484, the Silesian ambassador had a conversation with Richard, in which the latter expressed a desire to go on a Crusade. http://staffblogs.le.ac.uk/crusading/2014/03/20/a-crusading-richard-iii/ This may well be the inspiration for the painting. But it cannot be said for certain. An element of mystery still remains. Another Postscript: While examining a Google image of the Rothley Temple painted tapestry—more information about which is infuriatingly elusive—I wondered if it was possible the unknown artist had signed it somewhere. All the usual places proved negative, but then I spotted something which looks like a signature to me, but can’t be made out because the resolution of the illustration is too poor. I have indicated its whereabouts in the illustration below. Opinions please? A larger version of the picture is at the beginning of this post.